On our model George, we really show you that separates are what actually builds classic style. All the pieces you see here are tailored, as in they have definite design lines and are well fitted to our model’s frame. 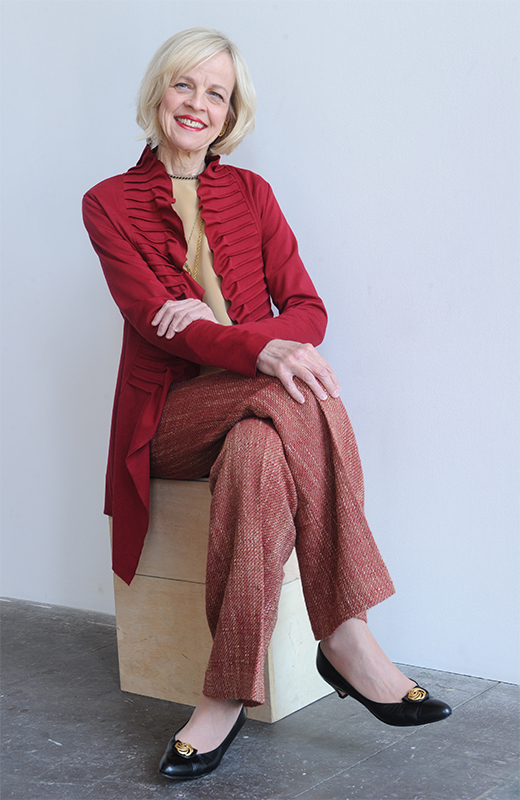 We start with a Dana Buchman blouse in a neutral mustard/beige tone that is easy to pair with other tones. The high-waist textured cotton slacks from Zara Woman were a real great fashion find! The wider leg is on trend for spring, and the weight of the fabric can transition into fall and winter just as easily. We have illustrated these base pieces with two jackets to give us different looks. The square-shouldered graphic jacket from Canvasbacks gives it a modern and crisp vibe. Conversely the burgundy cardigan jacket with its ruffled shawl collar has a softer feminine feel that takes the entire outfit in another direction entirely. Classic gold jewelry staples, such as the locket and medallion, as well as the earrings add just the right touch of shine and polish for either look. The black leather vintage shoes with gold flower detail on the vamp pull it all together without calling too much attention to themselves, thereby making them an awesome addition to anyone’s wardrobe. George radiates the confident, cool, and most of all, comfortably-fashionable look that we can all strive for in the New Year! Go bold or go home! Who says you can’t do bold patterns in menswear? Just witness the revival recently of the colorful casual sweater. Here, our model Devion sports a fantastic retro-hipster knit pullover from designer Beged-Or. While this crazy pattern isn’t for every guy, finding a fun graphic sweater that suits your personality should be on every man’s fashion resolution list! We’ve also demonstrated the idea here that white is not just for summer with the H.I.S. denim jeans shown with our awesome sweater. They help to create a color balance and make the sweater stand out even more in a positive fashion-forward way. The only thing a fine gentleman needs with this outfit are a cool pair of shoes like these navy and white lace ups by LaCoste that were already in Devion’s closet. Add in a simple belt and watch and you’ll be good to go. The fashion rule when utilizing a bold piece like this colorful sweater is to keep everything else on the neutral side. He looks bright and bold, and ready to take on the stylish life in the New Year!